Abstract Expressionism is a style of art in which LINE, SHAPE, COLOR, TEXTURE and/or a lack of detail emphasize a MOOD or feeling. Abstract art sometimes uses GEOMETRIC SHAPES and bold, bright COLOR in an exaggerated way to express the subject of a painting—MOOD. Sometimes Abstract art is a simplified style that is intended to just create emotion and deliberately abandon any resemblance to the natural world. Geometric SHAPE can be used exclusively in Abstract art to take the place of any recognizable natural or manmade object—in other words, a nonrepresentational or nonfigurative SHAPE. Abstract art is usually active, interesting and fun. However, this type of art bothers many people. They feel that “real” art must represent actual or natural objects. Some people cannot simply understand that the Abstract artist just wants to create a feeling or MOOD with the artwork, and nothing else. When Geometric Abstract art first came into existence, people were shocked. They could not see or understand WHAT these artists were trying to paint. They kept looking for a symbol of something real, something natural or manmade, because everyone used to believe that art had to represent actual objects. Geometric Abstract art is meant to be enjoyed just for the BASIC ART ELEMENTS or PRINCIPLES that are represented in the work—COLOR, LINE, SHAPE or FORM, TEXTURE, SPACE, RHTHMN, REPETITION or MOVEMENT. The pictures in this packet are ABSTRACT GEOMETRIC designs. An abstract geometric design can be created using any type of GEOMETRIC SHAPE (square, rectangle, triangle, circle, diamond, hexagon, octagon, etc.) or a combination of various GEOMETRIC SHAPES. The examples in this packet are active and create a feeling of MOVEMENT, RHYTHM, excitement and fun. This packet is a good time to introduce or review FREEFORM SHAPE. Robert Delaunay was born in Paris, in 1885. His family was very financially secure, so Robert was able to pursue his art career without needing to worry about money. Delaunay was very fortunate because many artists are very poor when they first start and must sell their paintings, just to buy food. This often forced artists to paint what the public would buy, instead of spending time experimenting with new styles and ideas. When he was only 17, Robert worked as an apprentice with a theater set painter. He also began his art studies. One way Robert studied art was to visit the many art museums and art exhibitions of Paris. At this time, Paris was the art capital of the world and many talented artists lived there. Robert met many of the artists of Paris and he often painted with them, to learn more about painting and art. His apprenticeship with the set painter lasted for two years and was the only formal art training Robert Delaunay ever had. Robert made people take notice of a new kind of art with his Circular Forms or Rhythms SERIES (a group of paintings created with the same subject and painted by the same artist), and his influence was felt beyond Paris, by many artists of his day. Artists were inspired to try this new geometric abstract type of painting. The public began to like Robert’s different ideas and his unusual work became popular. This was obvious when Robert was invited to decorate the outside of the Railway Pavilion at the Paris Worlds Fair of 1937. In other words, his artwork was liked enough to want his unusual abstract designs painted on a building at a very important world event. It was a huge compliment for any artist. 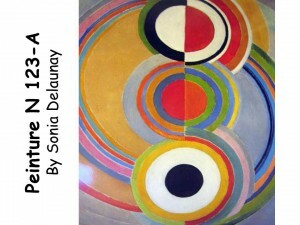 Robert Delaunay and his wife, Sonia, were both successful Abstract Expressionists. Robert lived until 1941. He was not even 45 yet when he died, which makes the art world wonder what other new ideas Delaunay might have created, if only he had been able to paint until old age. Around 1930, Robert began a SERIES of paintings. He called his series “Rhythms” or “Circular Forms”. This painting was created before the series (1912), when he first began experimenting with GEOMETRIC SHAPES and COLOR. 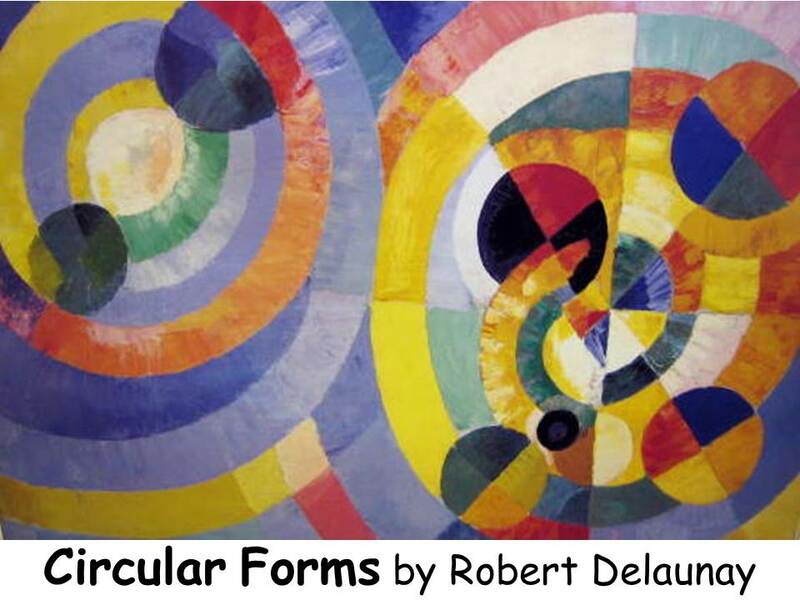 Delaunay was well ahead of his time as a modern artist when he painted this, a picture of total ABSTRACTION. Before this time, people would not have considered a painting of only GEOMETRIC SHAPES to be a real work of art. The artist uses a GEOMETRIC SHAPE (circle) and bright COLOR contrasts, to create a dramatic piece of art. His picture seems to have energy and MOVEMENT. Delaunay uses TINTS of COLOR. TINTS are pure color with various amounts of white added. Can you find any places where the artist deliberately left the TINT unblended? Give kids a chance to find these roughly colored areas first. If they are unsure about the question, point out an example for them and explain that the artist did not carefully blend the COLOR with the white. Where do you see VERTICAL LINE? HORIZONTAL LINE? DIAGONAL LINE? Notice how the artist has created other GEOMETRIC SHAPES with the way he has used color in his CONCENTRIC circles (circles inside of circles). Can you find any triangle SHAPES in this painting? Using color changes, the artist has divided the larger circle on the right into pie shape, or triangle sections. The smaller circles on the right are also divided into triangles. • Use a ruler and lightly draw a centerline that divides one of the concentric circle worksheets in half, vertically. Paint each arc created (by adding this centerline) a different color on each half of the circle. This will create an effect similar to Delaunay. Be sure that the centerline is drawn lightly enough that it does not show when you finish painting. • (Grade 4-5) Create your own concentric designs with arcs, using a ruler and compass. Paint using TINTS of color. on cardstock for each person. Paint second worksheet using only SECONDARY COLORS. • Use templates of GEOMETRIC SHAPES to create original Geometric Combination designs that overlap. • Paint an abstract design using concentric TRIANGLES or SQUARES. Kenneth Noland was born in Ashville, North Carolina, in 1924. He attended Black Mountain College, in North Carolina, from 1946 to 1948. In 1949, Noland went to Paris, where he attended a sculpture art school for a few months. When he returned home to the United States, Noland took a teaching position at the Institute of Contemporary Art, in Washington, D.C. and taught there until 1951. In 1954, Noland and his friend, Morris Louis (a painter) visited artist Helen Frankenthaler in her New York studio. Both artists were very impressed with Frankenthaler’s technique of allowing the paint to flow directly onto the unsized (raw) canvas, which let the paint seep into the canvas, instead of remaining on the surface. Borrowing this method, Noland began to apply his colors directly to the canvas, so he could study the relationship between the canvas and the colored shapes that resulted. Noland’s work focused mostly on color. Noland is still alive and an active artist today. His work explores the expressive possibilities of pure paint. The large flat areas of color and the absence of space that refers to the real world, characterize his paintings. In other words, his paintings are purely abstract and represent nothing natural, except COLOR. Most of Noland’s paintings are large (3’ – 6’), colorful, geometric shapes—circles, triangles (chevrons) and diamonds. This painting was done in 1958. The circle is a “CONCENTRIC CIRCLE”, which means that it is created using REPETITION of progressively smaller SHAPES within the same SHAPE (circle). All of the circles are not perfectly shaped. The outside circle is a little crooked, with a rough CONTOUR (or edge). Noland was not too worried about creating a perfect circle because he wanted to create a *spontaneously painted SHAPE (*quickly painted, imperfect, without exactness). The circle is given structure with COLOR. The GEOMETRIC SHAPE of the circle is used only as a way to express COLOR. The rough brush marks on the edge direct our eye towards the tiny drips of paint on the surrounding raw canvas. These paint drips whirl around the central circle like miniature meteorites orbiting a giant planet. The rough contour gives a suggestion of an atmosphere or an outer penumbra, which surrounds a planet. This concentric circle is centered on a square canvas. CONCENTRIC SHAPE can be made with any SHAPE. 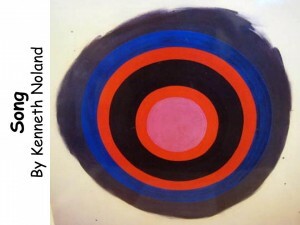 Noland created a SERIES of “Circles” paintings. A series is a group of paintings created with the same subject and painted by the same artist. Each of Kenneth Noland’s “circles” series paintings is centered on a square, with colorful and varying concentric circle PATTERNS. Artists create series paintings on many subjects—the sea, a particular Landscape setting, a particular animal, person or object. Claude Monet was another famous artist who created many SERIES paintings. Some of his series subjects included water lilies, haystacks and a French Cathedral. Kenneth Noland was one of the artists who pioneered the use of ACRYLIC PAINT in abstract art. 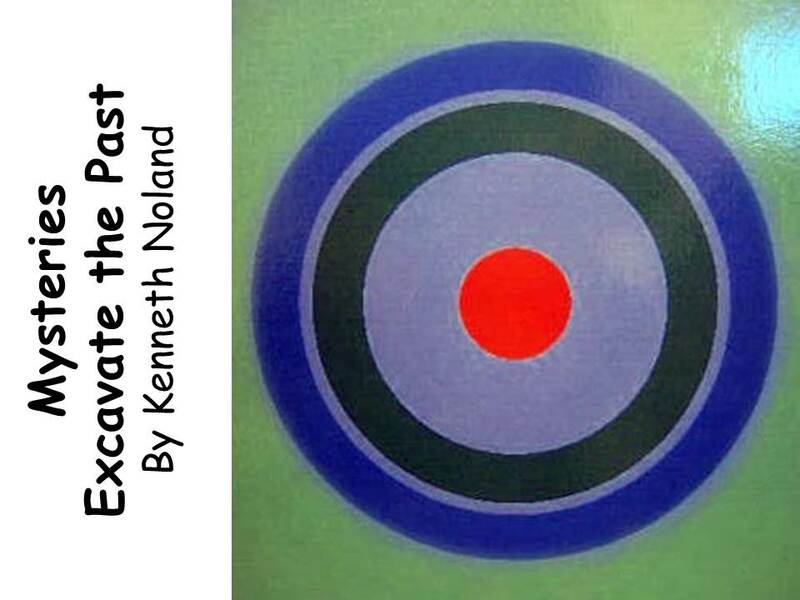 Noland is considered one of the most influential members of the “color field” or “stain” painters. For many years, Noland soaked (stained) diluted acrylic paint onto unstretched cotton canvas. This way, the paint soaked into the canvas instead of sitting on top of it the way thicker oil or acrylic paint tends to do. He applied the paint with brushes, sponges and rollers. In 1999, Noland began painting another series entitled “Mysteries”. The designs in this series are also created with colorful concentric circles but Noland now uses oil paints, which sit thickly on TOP of the canvas, instead of soaking in. By varying the widths of the concentric circle bands and changing the COLOR combinations, Noland created many different effects with his “Circles” series of paintings. The varying bands of COLOR in these circles seem to expand and contract, creating a pulsating sense of MOVEMENT and RHYTHM. ☺ Spend a little time discussing what ABSTRACT SHAPES or symbols are, before beginning this activity. Define FREEFORM SHAPE, GEOMETRIC SHAPE and ORGANIC SHAPE for the class. Explain that some abstract SHAPES are NONREPRESENTATIONAL, meaning they do not look like a recognizable object or an organic shape. Before showing Song to the class, ask them to draw (using markers, colored pencils or crayons) a picture of what a “song” looks like. Explain that song is an ABSTRACT concept—an IDEA not a noun (person, place or thing). Explain that they must use ONLY abstract, nonrepresentational SHAPES and COLOR to draw a description of this abstract word. Explain that they cannot use any musical “symbols” such as musical notes, musical instruments, sheet music, musicians or singers to create a visual interpretation of the word song, because these are each recognizable objects and symbols. Tell each artist to choose COLORS that create the MOOD that “song” creates when they think of one. their drawings and compare them. be. Compare Noland’s painting idea with the abstract “song” representations created by the class. Is everyone’s picture truly abstract and nonrepresentational? How many chose to use GEOMETRIC SHAPES? How many chose to use FREEFORM SHAPES? How many used various nonrepresentational LINES? a NONREPRESENTATIONAL, abstract picture of an idea such as “song”. ☺ Have kids create GEOMETRIC SHAPE with their own bodies (especially effective for K-1). Group older kids (3-5) to create SYMMETRICALLY or ASYMMETRICALY BALANCED geometric living body sculptures. • Use squares of unstretched canvas fabric or muslin for this painting project. Tape the square to the top of the desk, with masking tape, on all four sides. Use watercolor to paint a design using concentric circles. Notice how the paint soaks into the fabric, which can make the circles a little rough around the edge. Discuss using just a little water so colors will be brighter. • Use bright acrylic paints to do the same project. Regular acrylics will sit on top of the fabric more than the watercolor paint. Be sure to put a piece of newspaper under the fabric. Acrylic paints will wash up with water, as long as the paint is wet, but will not come out of clothes easily, so remind kids to be careful. Do not tape the fabric down, but be sure the squares have been pressed, so that they will lay flat for easy painting. Notice how the undiluted acrylic sits on top of the canvas. • Use a spray bottle of diluted paint (for both of the first two projects) to create the paint drips or miniature meteorites, like Noland’s painting. Spray very lightly. You don’t want to soak the canvas, only leave a few small dots. • Let younger kids use finger paints and fingerprints to color in one of the concentric circle worksheets. Explain that each ring is painted a different color. • Use larger construction paper for younger kids and let them create their own concentric circles using finger paint or tempera paint with a large brush. Explain that the circles don’t have to be perfect. Have them paint the rings using the three primary colors. • (Grade 3-5) Print copies of the Chevron worksheet on cardstock. Explain that Kenneth Noland would paint each strip of his chevrons with a different color and the background was yet another color. Let them paint the page. Instruct them to add to the picture, if they would like, using only GEOMETRIC SHAPE. • (Grade 3-5) Show an example of the Chevron worksheet. 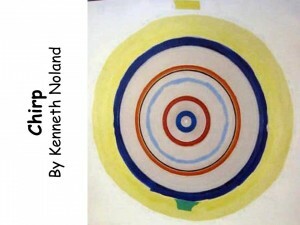 Explain that Kenneth Noland sometimes made the bottom point of the first triangle touch the bottom of the square. Have kids use rulers to create a chevron design of their own to paint on a colored paper background. Use two PRIMARY or SECONDARY COLORS of paint, making the construction paper the third color. Alternate these colors to paint the chevron bands. Remind them to decide if their chevron design will touch the bottom of the paper or only go partway down, like the example. • Create a concentric circle design using graduated sizes of construction paper circles in a variety of colors. Kids could trace the circles using poster board templates but it would be better to have the circles already drawn for younger kids (K-1). This is a great activity for younger kids to practice their cutting skills. 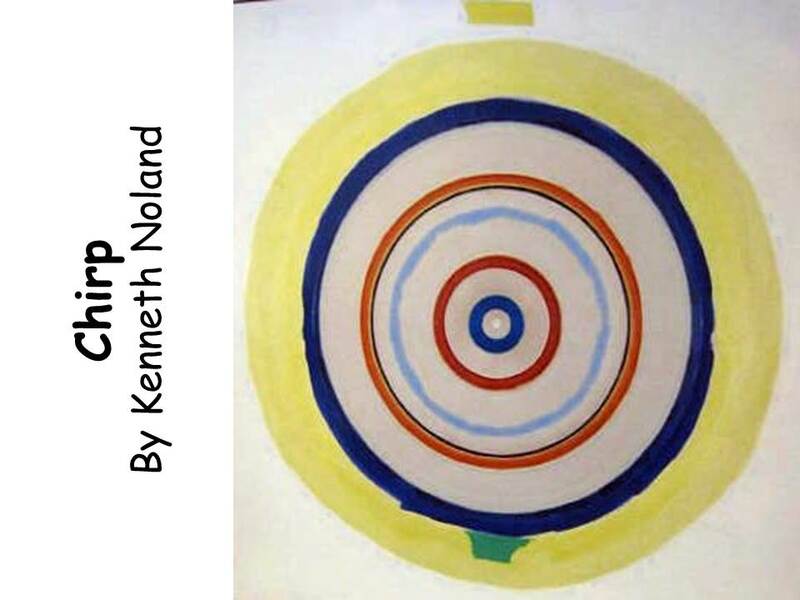 Remind the class that Kenneth Noland’s circle is not perfect and they need to not be critical of how smoothly the circles are cut. Sonia Terk was born in the Ukraine, in 1885. Sonia was raised by an uncle in St. Petersburg, Russia. When she was older, she studied art in Saint Petersburg and Karlsruhe (kärls’rūə), Germany, before moving to Paris in 1906. Because Sonia loved the use of bright color in her paintings, the works of the artists Paul Gauguin and Vincent van Gogh were a big influence on her own art. 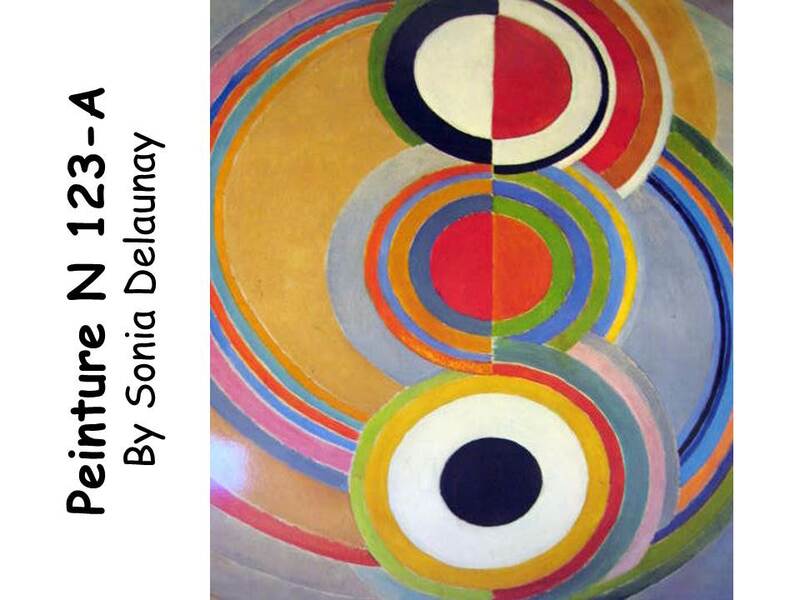 In 1907, Sonia met the French painter, Robert Delaunay, one of the pioneers of modern abstract art. In 1910, Sonia married Robert and soon began to create abstract paintings herself. Eventually, her paintings became exclusively abstract compositions of GEOMETRIC SHAPES painted in pure colors. After a trip to Portugal and Spain, Sonia introduced RHYTHMICAL variations into her large, brightly colored canvases. In 1922, she revolutionized the art of fabric design by creating fabrics with ABSTRACT PATTERNS and bright contrasting colors. Fashion designers are still influenced by Sonia Delaunay’s work. Sonia began to experiment with set design, and, along with her husband, created sets for Dighilev’s ballet, Cleopatra, and for a French movie. In 1937, the couple decorated the Air Pavilion and the Railway Pavilion at the Paris Worlds Fair. In 1947, Sonia and her husband Robert, along with some other abstract artists, established their own Art Salon. When Abstract Art first came into existence, people were shocked! Artists were expressing ideas in terms of SHAPE and COLOR instead of realism. How could abstract geometric shapes be true art? If you had painted this picture, what might YOU have titled it? There is not literally a vertical LINE painted in the center of this painting. It appears to be a LINE because the colors abruptly change at the same place in the circles. Notice how the same thing happens in Robert Delaunay’s picture. 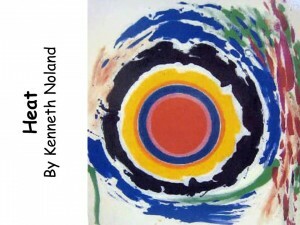 In Kenneth Noland’s picture, only the bands of various COLORS create LINE. • Use a compass to create “rainbow” pictures, using arcs of different colors and different widths. • (Grade 2-3) Cut three 2 ½” circles from PRIMARY COLORS of construction paper. Fold and cut the three circles EXACTLY in half. Choose a SECONDARY COLOR 9” x 12” piece of construction paper for a background. Match each circle half with a different color half and glue to the background. The idea is to have three circles in a row, above and below each other, in the center of the paper. • Create a CONCENTRIC CIRCLES project similar to one above by cutting three graduated sizes of circles. Cut two of the largest size circle in two PRIMARY COLORS then cut these in half. Glue half of each colored circle, side by side so that each side is a different color, to a SECONDARY COLOR background. Now cut two of the next smaller sized circle from different SECONDARY COLORS than the background. Cut these two circles in half. Glue two different colored halves together, centered on top of the larger circle, in the same way as before. Cut two even smaller sized circles from two PRIMARY COLORS and glue these in the center to create much the same effect of Sonia’s picture. Be sure to line up each colored half to begin and end so that the color change creates the illusion of a line. This will create a RADIAL BALANCE design. The bands of color do not need to be the same size so you may use largely varying sized circles. • Create GEOMETRIC CONCENTRIC SHAPES (triangle, square, diamond) by gluing colorful yarn to cardboard. Use at least three colors of yarn and at least three repeated SHAPES in three graduated sizes.